With so many FREE activities happening over our Family Weekend, we've taken out the guess work for you! 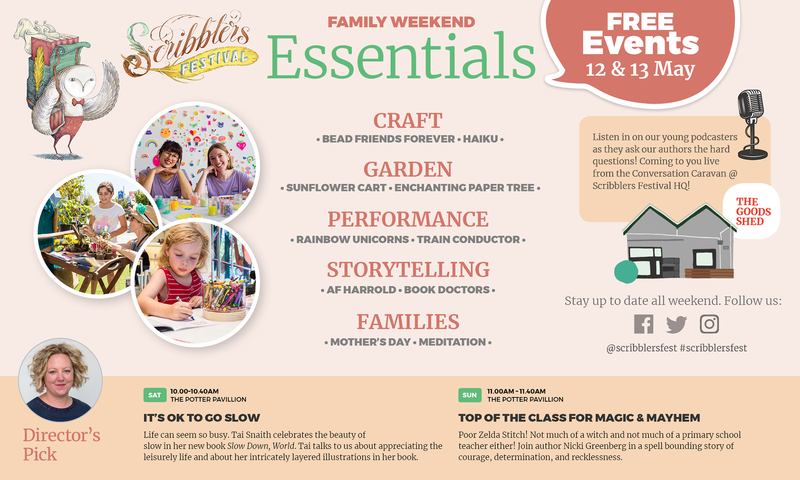 [Download] our Essentials Guide to maximise your Scribblers Festival fun! Check out Bead Friends Forever, where you'll step into the bright and colourful world of small magical objects, made from iron-on beads. Make your own beaded creation at two workshops with beading besties, Alina Tang and Johanna Acs, Sat 12 May 9.00am-12.00pm, Sunday 13 May 12.00pm-3.00pm, FREE, The Goods Shed. Find your inner poet and create a haiku masterpiece out of words cut from old book pages at our Upcycled Haiku station in The Goods Shed or add your mark to a Collective Cartography mural with Aviva Reed. Spend some time in our Scribblers Garden, leave us a note in one of our Festival bird houses, visit the Sunflower Seeding Cart on Saturday to take your own potted sunflower home, or grab a bunch of flowers from the Tussie Mussie Flower Cart on Sunday and give them to mum! Watch our paper tree come to life inside The Goods Shed as international artists Cris Wiegandt and Lacy Barry weave their magic with paper and scissors, and don’t forget to add your own leaf to the tree. Fall in love with a pair of rainbow unicorns as they prance around Scribblers Festival each morning, but you'll have to be here early to see these unique performers. Performance times both days: 9.00am and 10.15am. Watch a slam poet in action as A.F. Harrold steps up to the microphone and performs in The Poet’s Corner. Step right up and listen to a story from our Scribblers Train Conductor, who’ll be doing the rounds at the Festival each day, sharing literary tales. And if you’re looking for a new book to read, book an appointment with a Book Doctor. Throughout the weekend, they’ll be prescribing the perfect books for you to read. You can write your prescription in your Scribblers Passport and Field Notes Guide. Pick one up for free from The Goods Shed. Celebrate mum and spend some quality time together at The Big Breathe, an opportunity for you to shake off life’s stress in a guided meditation by Megan Sanderson. Then visit our Mother’s Day Markets for sweet treats from Mary Street Bakery, Rochelle Adonis and The Flour Press - yum!